For my last morning hunt Kent and I decided I should hunt the Tree Belt. This is the stand I've hunted most of the week. There are good bucks in the area and the South wind was good for this location. At first light I had a doe and fawn come in. They would soon be harassed by a young 8pt. He was not a shooter. Forty five minutes later a shooter showed up. He was a main frame 10 with a G2 kicker and stickers. His antlers were super tall, with great tine length and good mass. What he lacked in spread he made up for in height with main beams that almost touched. I didn't have to think about it, he was going to be shot. He fed at the bait for 18 minutes - which is ridiculous. The problem is he was facing me the entire time and presented no ethical shot. When he finally decided to move on, he walked at me. And he took the route under my stand. 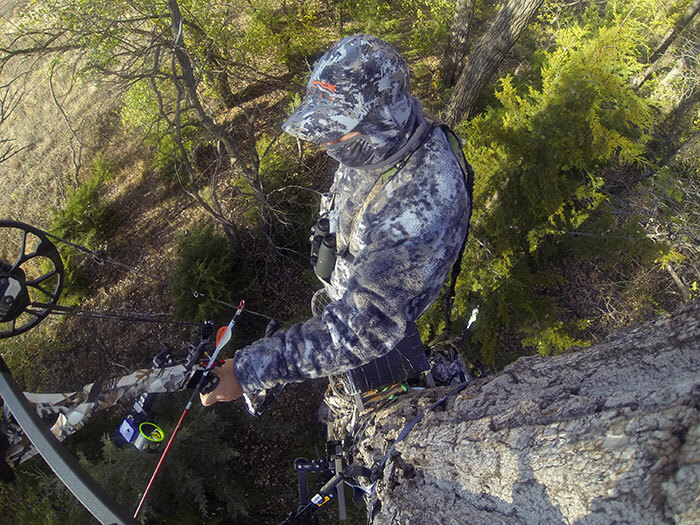 I turned my video camera to anticipate his route and drew my bow. He was walking quickly so I made one of those "nert" sounds but it failed to stop him. The angle was severe but I was calm. I shot when he was broadside and missed him clean - or so I thought. The buck ran out 20 yards and looked back at me before walking off unalarmed. I wanted to see what happened so I went back to the footage. Unfortunately, he was closer than I anticipated and was out of the frame. I was pissed. I blew a very close shot. I texted Kent, Jake, and Tom and told them I had screwed up and clean-missed a big buck. I nocked another arrow. Then I decided to glass the arrow and noticed there was hair on both sides of the shaft. I could see blood 2 feet from the arrow. 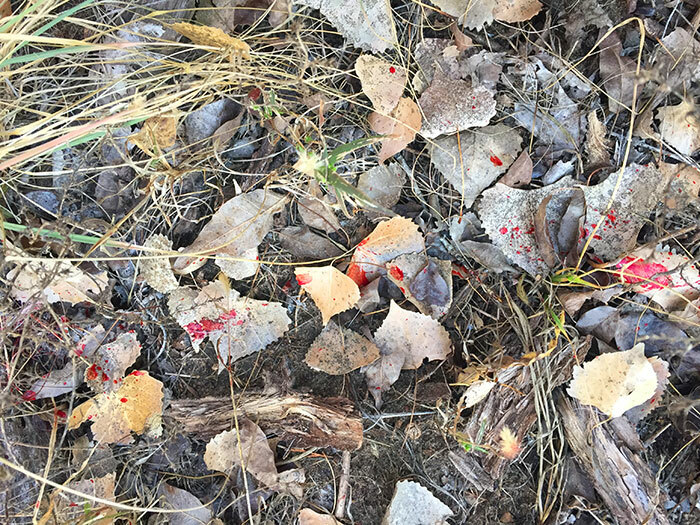 As I continued glassing the trail, I could see more blood - in fact the blood trail was obvious. I did not miss him. At this point I was confused. What I 'thought' I saw was a close, low miss. What happened was very different. At this point I had very little information. I needed more data. I waited 30 minutes before climbing down to check my arrow. It had blood and hair on it, but it was not saturated with blood. Zero sign of any digestive matter. I walked the trail for 30 yards and it was ridiculous. There was blood everywhere. I then went back to my stand to regroup and call Kent. I wanted to play it safe. I knew it wasn't a gut hit, and the blood trail was good. Kent and I discussed it over the phone. We would wait another two hours (three hours after I shot) and take up the trail. It was more like 3.5 hours by the time we got started. The blood trail was fantastic for the first 100 yards. It was steady for the next two hundred. Before we knew it we'd gone a quarter mile. I've been on enough tracks to know when the trail is running too long. And I knew at this point I screwed up. This recovery would take a miracle. We had a blood trail for 3/4 of a mile which led us out into a CRP pasture. We followed blood to a series of plumb thickets and that's when my buck jumped up and ran across the CRP before effortlessly jumping a 5' fence. He was now off the property which was bad. Kent did not know the owner. Trespassing was a non-starter. Kent had a hunch that he may cross the road to the North - onto a property that Kent's friend owns. We got lucky! He was right. We found fresh tracks and blood and followed him across the road to his buddy's property. 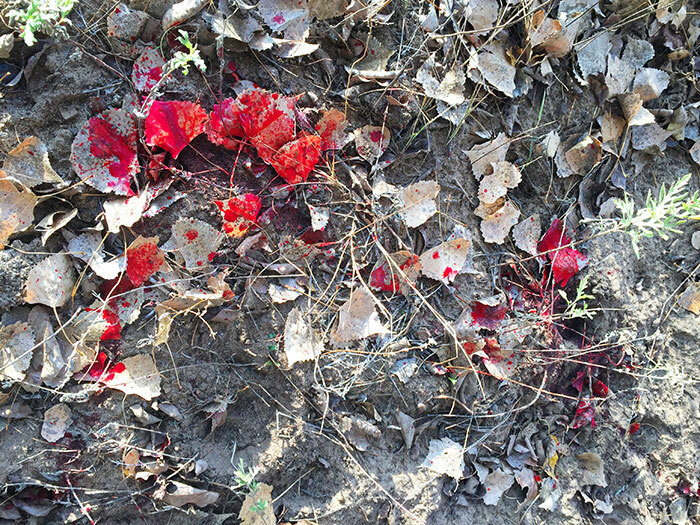 We continued the tracking job finding more blood easily. He went another half mile before crossing onto yet another property. At this point, he'd gone more than a mile. He jumped three fences and a fallen tree. We both agreed to call it off. 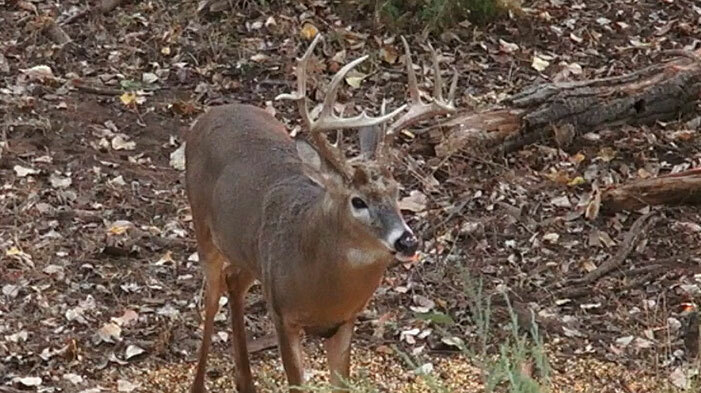 We don't think this buck was fatally hit. I'm pretty sure my shot went through the armpit. If so, there's a good chance he will survive. I hope so. My hunt is over. No excuses. No arrows hitting branches or brushing up against my clothing, jumping string or any of that nonsense. I was unable to stop the deer which would have given me two seconds to line everything up and shoot for an exit wound. I shot too fast and paid the price for it. I'm not all-bummed out. This stuff happens and I always consider it a learning experience - even for guys who've been at this game a long time. I'm always honest about what happened during our live hunts, even if things go south. So my hunt ends on somewhat of a down note. I'm sure my two buddy's will do better than I did, and hopefully they will continue to update all of you on the live hunt thread. Next year I'll be back and hopefully can redeem myself. 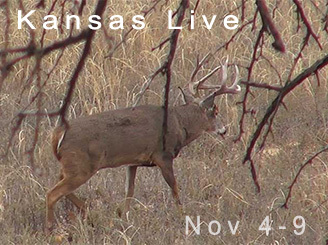 Thanks for following our hunt and good luck this season.